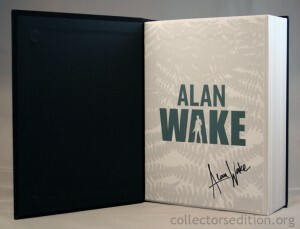 I picked up the Alan Wake Limited Collector’s Edition last night and I must say I’m very impressed with it. A game that was first announced around the Xbox 360’s launch it’s been a long time coming, and they definitely delivered on making this what I would consider to be the best CE release so far this year, and definitely one of the most unique CE’s this generation. Those of you who collect sealed games should be aware that the entire outer case comes shrink-wrapped from the factory. Even the sleeve is contained within the shrink wrap. The cover art is fantastic, and while I usually hate the hero + title = cover formula that you see on 99% of game covers it’s done here in a way that make it look like what you’d expect to find on the cover of a horror/thriller novel by the likes of Steven King. 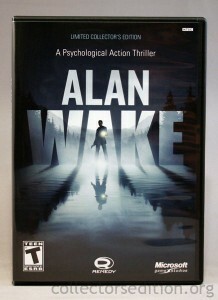 The hero is just a silhouette and the concentration is on the title and the over all mood. 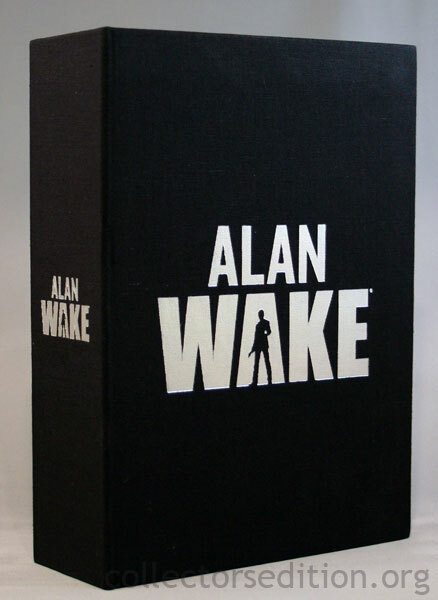 Once the slip cover is off the main case is a very convincing book, it’s got the same heft as a book and the “cover” material feels exactly the same as the material used on a hard cover book. The lettering here is an embossed metallic similar to what you’d find on an actual hard cover. The silhouette detail on the back is a nice touch too. 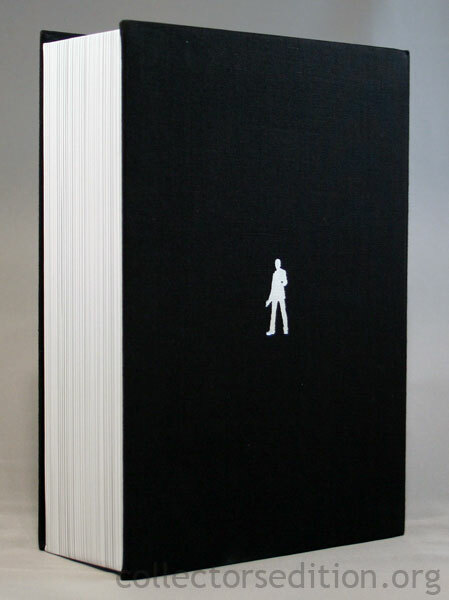 The “pages” are just a thick chipboard box that has been striped to look like pages, it’s not very convincing once it’s in your hands but from a small distance it does actually look like a book. The cover is magnetically clasped to keep it closed. 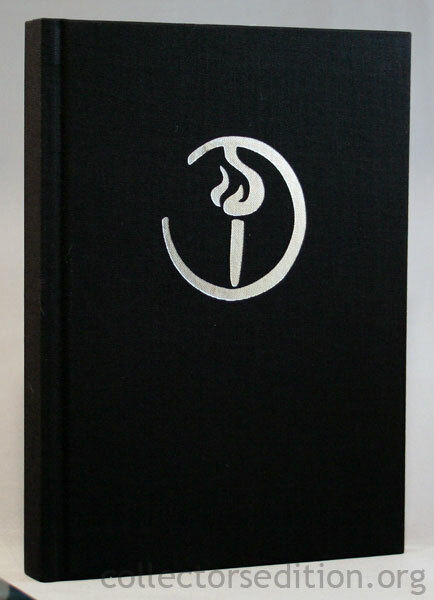 The binding of the book separates to reveal what looks like 3 additional books. Only one of them is though. 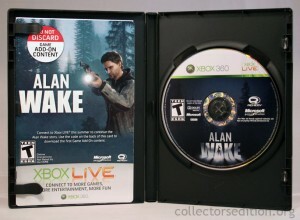 Inside you’ll find a standard plastic game case with the game disc, manual, and content code card. An actual hard cover novel written about the fictional story of Alan Wake including both color and black and white images, as well as a 2-disc digi-pak case with the soundtrack disc and a bonus content disc. 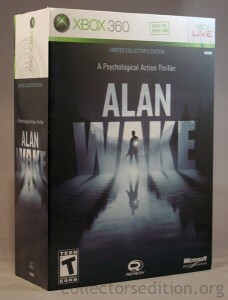 The game case is pretty standard, the artwork mimics the outer case but it s a bit more clean, the back of the case is plain black and rather than going with the standard Xbox 360 green case color they went with black. Normally I don’t like when the plastic cases break style with standard Xbox 360 cases but here it really works, a bright green border would likely be visually distracting. Inside the case is pretty standard fare, there’s the game disc and manual, as well as a content code card for the LCE’s downloadable content. I found it interesting that they put a large warning on the content card instructing you to not throw it away. 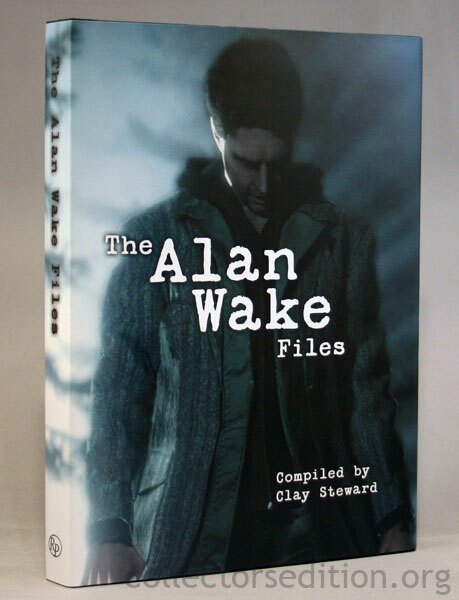 The only item inside the case that breaks from the image on the main box is the hard cover book, the fictional “Alan Wake Files” compiled by the fictional “Clay Steward” is basically the fictional novel that the game is based on. This book includes a hard cover made of the same material as the main case, very high quality and loaded with content. 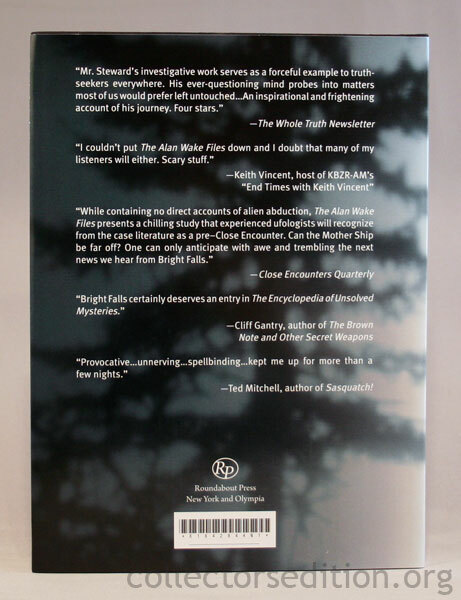 The visual details of this book are fantastic, it has fake reviews on the back of the jacket as well as a forward and an about the author on the back flap. You could put this in a book store or library and it would be right at home. 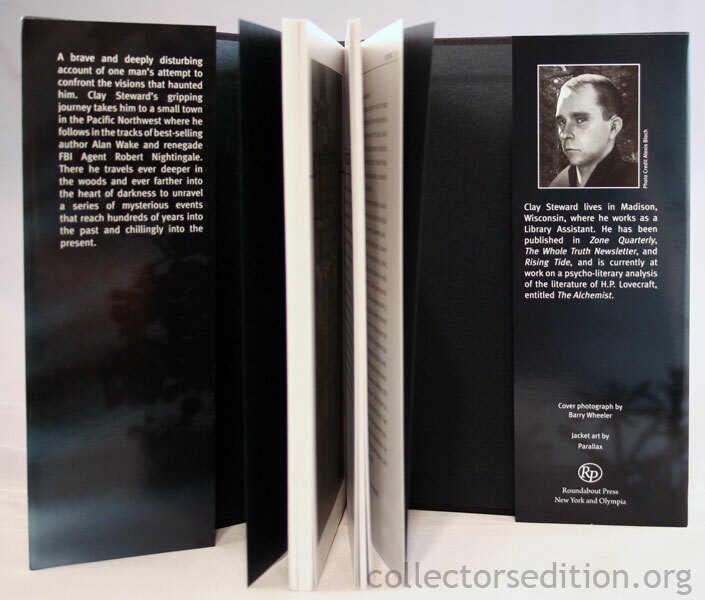 The digi-pak case mimics the artwork found on the outside of the box, though a little cleaner, from an outside perspective it looks almost like a paperback book. 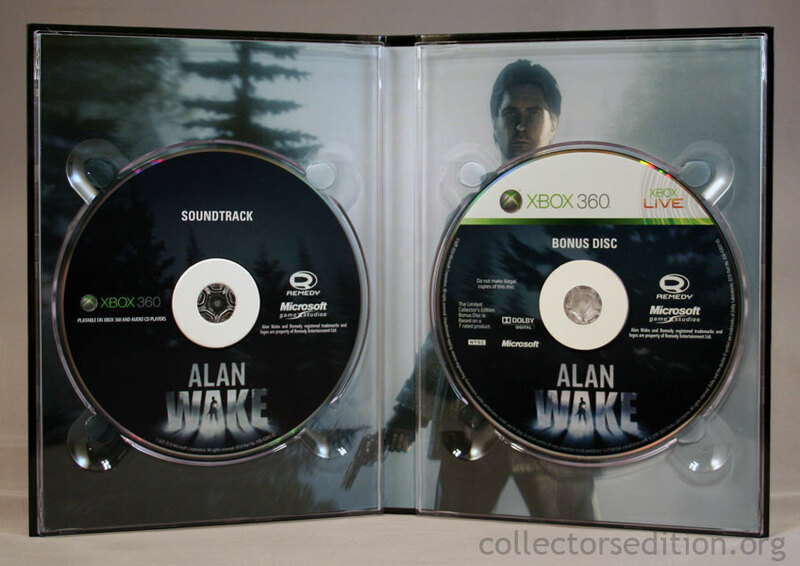 Inside the case you’ll find the soundtrack CD as well as a bonus disc that contains additional content for your Xbox 360 (themes, avatar items, etc). Both discs had a small cardboard ring around the center, presumably to prevent the discs from coming lose during shipping. 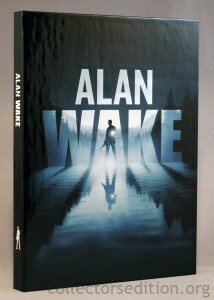 It’s attention to details like this that make the Alan Wake LCE one of the best CE’s I have in my collection. I would consider the Alan Wake LCE to be one of the best CE releases in my collection, it hits on all the marks, the visual style of the case is fantastic, it’s incredibly sturdy, and it’s one of the most unique case designs I’ve ever seen. Not only is the design unique but it’s incredibly appropriate for the game, the other bonuses and the way they were included in the package is also done incredibly well. Attention to quality such as the little cardboard donuts on the bonus discs to keep them from coming lose during shipping, and shrink wrap over the slip cover proves that they actually thought about the package and cared about it’s quality as opposed to just throwing a bunch of stuff in a box that looked good on a bullet list and made them a few extra bucks. I’d say this ranks right up there with the CEs for Bioshock 2, Fallout 3, and all the other extremely well executed special releases; 5 stars, 10 out of 10, A+, 100% or whatever other metric you’d want to apply to this release, it gets my highest score. Looks awesome. I am surprise this edition isn't sold out in store. I was uber impressed, also worth noting that in the UK this edition cost the same as the standard. They only got 2 copies of the LCE here in Iceland. 2 copies for the whole country! And they charged an arm and a leg for it...well, close to it, at least. Had to fork out the money equivalent for 2 retail games. That looks like a great CE, thanks for sharing the pics! Got this off Amazon for $40. I'm afraid to open it. Lol.